The Original Sleeper is perfect for the outgoing couple on a budget who want basic cooking facilities and a good night´s sleep at the end of the day´s adventures. This vehicle is automatic and easy to drive. Has basic cooking facilities: sink, fridge, bedding for two and a fold down double bed, an ipod/MP3 connection, and an auxilary battery. 1999-2004 Toyota Estima or similar. The Happy Black Sheep is ideal for backpackers or the budget conscious traveller who is looking for a reliable sleepervan that is spacious with a large sized bed and reliable and modern. 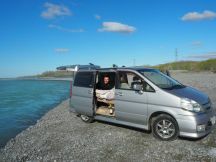 The sleepervan is automatic, making driving very easy for touring around New Zealand. It comes with all that is required including bedding, towels and tea towels, basic cooking facilities and utensils and basic living equipment. Vehicle 2005/06. Baby/child seat not allowed in this vehicle. Sleepervan - Nissan Serena or similar, year 2004. The perfect solution for the budget traveller. The sleepervan handles more like a car than a van giving an enjoyable ride. Just the essentials (bed and cooking gear) without the clutter. Bed folds up to futon sofa. Theses rental campervans are not sign written so you can have the privacy where ever you travel. Hire table & chairs NZ$30 for outdoor dining! Sleeper car - Nissan Tiida, year 2000+. The perfect solution for the budget traveller. The sleeper car has been modified (back seat removed for bed) a van and car in one! Window black outs for privacy​. This is more of an option for campers who were wanting to take a tent. Just the essentials (bed and cooking gear) without the clutter. These rental sleeper cars are not sign written so you can have the privacy where ever you travel. Hire table & chairs for NZ$30 for outdoor dining! (Not included in hire cost). 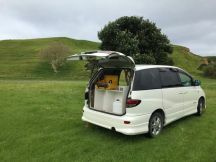 Sleeper Camper - Toyota Estima or similar, year 2004-2008. This mid range priced sleeper camper handles more like a car than a van giving an enjoyable ride. Just the essentials (bed and cooking gear) without the clutter. 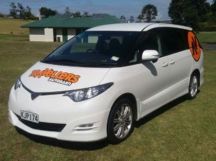 These rental campervans are not sign written so you can have the privacy where ever you travel. 2 Over Shoulder seatbelts. This vehicle is not certified self-contained. CANNOT freedom camp in this vehicle. The Tui Deluxe sleepervan is made for glamping. 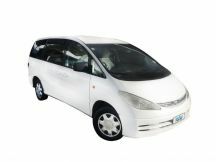 It has luxurious features and is certified self contained and is still easy to drive. The Sleepervans can go where big vans can't go. Big comfy bed with high quality linen. A Rear Awning is included for a covered kitchen area for all weather cooking. Two sliding doors and a boot to make access easy. 2008 Toyota Voxy 2L. Certified Self Contained. Can Freedom Camp in designated areas. You are viewing page 2 of 3.